After obtaining the necessary technical qualifications, in my case B. Sc. (Eng.) London, A.C.G.I. (Associate of the City and Guilds Institute of Engineers) and D.I.C. 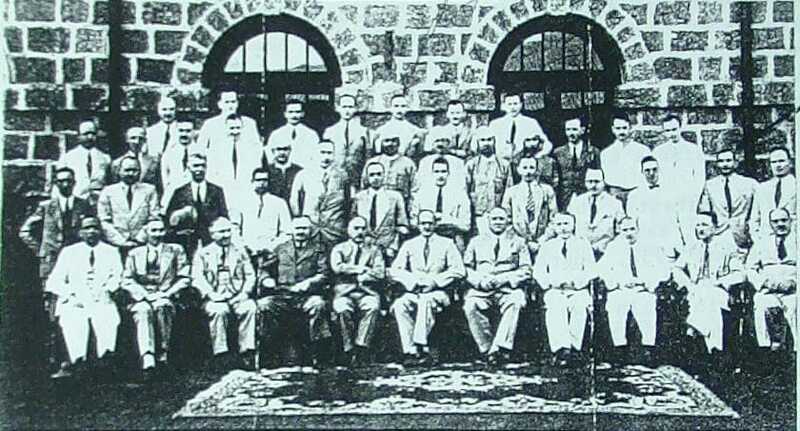 (Post Graduate Diploma of the Imperial College of Science and Technology in Structural Engineering) and working on some engineering projects in London in 1926 and 1927, I was informed that the Burma Railways Company, whose company head office was in the City of London, required some young Civil Engineers. ​Rangoon to Mandalay via Pegu, Toungoo, Pyinmana, Yamethin, Thazi and Myitnge. Mandalay to Myitkyina via Ava, Sagaing, Ywataung, Shwebo, Kanbalu, Wuntho, Naba, Mohnyin and Mogaung. Pegu to Martaban via Mokpalin and Thaton. Mandalay to Lashio (the branch line up into the N. Shan States via Maymyo at about 3,500 feet altitude and the summer residence of the Government of Burma and also the uncompleted rail link to the Chinese border. Rangoon to Prome, Tharrawaddy and Bassein via Insein (the site of our Loco. Workshops and the offices of the heads of the Locomotive and Electrical Departments of the Railway. Thazi to Myingyan via Meiktila. Ywataung to Ye-U via Monywa on the Chindwin River. ​On the whole, I think I can say that I enjoyed my three years stay and work in this part of Burma, which is well provided with flora and fauna. Many lengths of the railway ran among hills and forests and, as I was the possessor of a B.S.A. double barrel 12 bore shotgun and a Colt 44 bore rifle and was keen on shooting, I was able to relax from my railway work at times by shooting either jungle fowl or Pheasant or Partridge and, in season, Snipe and Woodcock. The Station Master and I, with guns loaded, took up position standing about fifty feet apart to the right and left of the patch of jungle and the villagers started "beating" with much shouting and beating of bushes. The panther objected to this, as presumably it was still eating its kill and roared and charged at the beaters who hastily retreated. However, as more beaters arrived, they soon resumed the "beat" and I saw the animal run out of its patch of jungle and come up a path towards me. As I waited for it to come within range of my shotgun, the Station Master, who was further away from it and hadn't as sgood a sighting of it, fired. I could see his shot miss the panther and the animal stopped and leapt into the bushes on the other side of the path and dsappeared. I was very diasppointed that we hadn't shot it. Some two weeks later, I heard that it was still scaring the local villagers and killing their cattle and that some Shikari had "sat up" near a kill and had "bagged it." ​One usually played tennis on the club courts in the evening and later relaxed with a drink and a game of bridge or billiards in the clubhouse. One was also able to relax and enjoy some of the social life when on tour at the northern end of the railway at the town of Myitkyina. In 1931 I had my transfer orders. I had, during my three years in this northern most section of the railway, managed to avoid getting Malaria, for which the area was notes. Instead, through unknowingly eating contaminated food in a railway "refreshments room," I contacted Amoebic Dysentery. The only treatment for this appeared to be injections of Emetine Hydrochloride. This stopped the effects of the Dysentery so that one could continue one's normal activities but did not cure it. Although I should have taken some casual leave and gone to Rangoon for proper treatment, I continued working and at intervals of two to three months, receiving an Emetine injection. I paid for my stupidity regarding this a few years later when, owing to Amoebic cysts having got into my blood, I found all my joints seizing up and I could walk only with some difficulty and with the help of two walking sticks, but more about that condition later. ​Our social life, when not on tour, was often spent at the Mandalay Club, which was situated within Mandalay Fort, where also was the old Mandalay Palace. These were all destroyed in the course of the fierce fighting to capture the Fort from the Japanese in 1944. ​The work of the Assistant Engineer in Rangoon not only involved the maintenance of all main and suburban line tracks and many siding in goods yards and the engine workshops at Insein, but he was also responsible for the repairs and maintenance of all service and residential railway houses in Rangoon and Insein, which were many. This latter work sometimes required the exercise of some diplomacy on the part of the Engineer, when the requests by the wives of some senior staff for some special work to be done as soon as possible to their houses, conflicted with other work. However, there were some compensations in living and working in the Capital as one was able to enjoy a social life as a member of the Kokine Swimming Club, the Pegu Club and the Gymkhana Club and there were also good shops, restaurants and cinemas. Japan's invasion of China did not concern us much in Burma in 1940 nor the military occupation of Indo-China in 1941 but her continued pressure on China and the blocking of China's ports by Japan's greatly increased navy necessitated in China having to find other means of getting supplies into that country and so Chiang Kai Shek appealed to Britain to allow these supplies to enter China through its "back door" i.e. through Burma via the railway to Lashio. It was about this time, i.e. April 1941, that I was transferred from Rangoon and posted to Maymyo as Engineer in charge of the Mandalay to Lashio branch line with the special responsibility of surveying and reporting on the possibility of increasing the capacity of this single track line. This railway track which, after reaching the N. Shan Hills about 15 miles east of Mandalay, climbs for 12 miles continuously up in a 1 in 25 gradient to an altitude of 3500' where it reaches the hill station and Burma's summer capital of Maymyo. From there, it proceeds over hilly country for another 90 miles or so to Lashio, near the Burma China border. Maymyo itself was a very pleasant town and its cooler climate was enjoyed by all who could get away from the planes to the hills. The countryside through which the railway ran, both up to Maymyo and beyond, was lovely and spectacular, especially at the Gokteik Gorge, which is crossed by a steel trestle viaduct, 320' above the floor of the valley and 800' above the river which flows through a natural tunnel under the viaduct. In this hilly country, the scope for extending and enlarging the railway station yards in order to accommodate more or longer freight trains was somewhat limited. However, it was my job to consider the possibilities and make plans and estimates for Head Office to approve. At the same time, no doubt at some pressure on Burma and the Railway Management by Britain and China, it was decided to extend the railway from Lashio to the Chinese border and the Chinese would connect with the extension to Kunming. 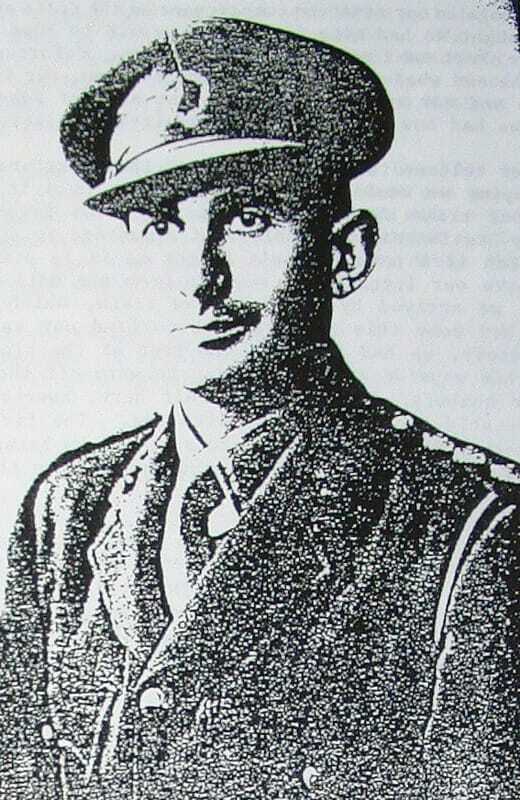 To carry out this project on our side of the border Sir John Rowland was appointed Chief Engineer and Cyril Kendall and John Hossack his Executive Engineers. The reconnaissance and survey work for this project was soon started. My work necessitated my being out on tour of the railway mainly between Maymyo and the end of the line at Lashio, for about 20 days a month. Occasionally I also visited my District Engineer in Mandalay but, as Mandalay was quite a few degrees warmer than Maymyo, these visits were somewhat brief. However, I recall on one occasion having been invited to stay with our friends, the McLean's, in Mandalay where Angus McLean was head of the Agricultural College. I decided to take my wife down by road from Maymyo, a distance of about 50 miles with some hairpin bends. I still enjoyed driving my Vauxhall Saloon car, which I had taken out to Burma after my home leave in 1936. Having lunched with our Mandalay friends and left my wife with them, I started on my return drive to Maymyo. I had driven about 15 miles when I was amazed to see an enormous snake cross the road some yards ahead of the car. On both sides of the road, the jungle was quite dense and by the time I stopped the car and got out my 12 bore shotgun, it had disappeared. I had seen many snakes in Burma, especially during the rainy season when the flooding of the countryside causes many of them to come onto the dry railway embankments. I went into the jungle to see if I could see it and managed to shoot it as it started to climb a tree. With the help of my servant, who was with me, we carried it and dumped it in the boot of the car. When back in Maymyo, I had it skinned and the very prettily marked dark brown and cream coloured Python skin, about eight foot long and nearly a foot wide, was sent away to be professionally cured. We received it back from the tannery six weeks later and a local cobbler made my wife two handbags a pair of shoes and a pair of slippers. The Japanese forces having captured Moulmein and crossed the Salween river by the 9th February, thrust westwards, easily out manoeuvering and overcoming such resistance as our limited troops could offer. By the 20th February they had reached the Sittang river, the next major obstacle. The Sittang Railway bridge which is the only bridge over this river, is some 2,250' in length and the river flowing under the bridge is deep and fast. In order that military road vehicles could cross this bridge, the railway track had been hurriedly timbered over. The demolition with explosives of at least one of the 200' steel spans of the bridge to deter the Japanese advance had been intended by our army when they had retreated over the bridge, but an advance party of the enemy had reached the east end of the bridge, so in the confused fighting its demolition was carried out resulting in many of our troops and much equipment being lost. 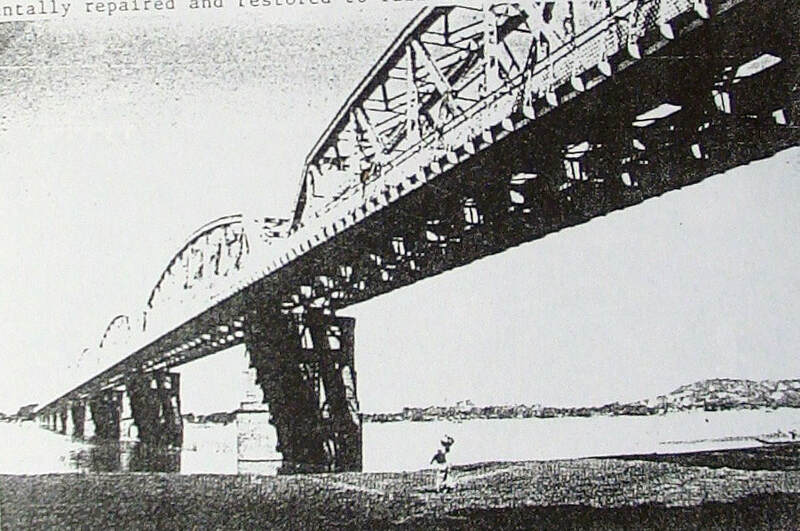 ​ The Railway Bridge over the Bonchaung River demolished by the Chindits on the night of 6th March 1943. This event is described thus in Bernard Fergusson's book "Beyond the Chindwin." "David (Whitehead) hoped to have the bridge ready for "blowing" at half past eight or nine; he had already laid a hasty demolition, which we could blow if interrupted (by the Japanese.) Duncan (Menzies) had everybody ready to move at nine, mules loaded and all. David gave us five minutes warning and told us that the big bang would be preceded by a little bang. The little bang duly went off and there was a short delay; then... The flash illuminated the whole hillside. It showed the men tense and waiting, the muleteers with a good grip on their mules; the brown of the path and the green of the trees preternaturally vivid. Then came the big bang. The mules plunged and kicked, the hills for miles around rolled the sound of it about their hollows and flung it to their neighbours."